The next act of Fables begins, as the Adversary plots how to destroy the earth after the most recent acts of Bigby and his secret agents. Meanwhile, the Fables regroup from the own flurry of changes, and Bigby and Snow learn how to live life as a married couple. It's always the parents who throw a wrench in things, as they are soon to learn. 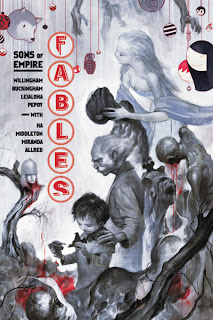 And if those two plots aren't enough for you, Willingham has a bevy of backup stories fleshing out the world of the Fables, with a whole host of guest artists. All this and Santa Claus, too? What might some Fables wish for, given the chance? As per usual, Willingham has filled the pages up to the brim with ideas and story hints that may take months to blend into the main narrative. Using the vast world of European mythology, he is able to create an even bigger world as he moves along. Rapunzel, Hansel (as a puritan witch hunter, a brilliant casting move), and others move into the spotlight, telling their parts of the world of Fables. Some old favorites sneak in as well, such as the Three Little Pigs. Part of the fun of reading Fables is to see which characters Willingham finds a use for next. There are several threads that Willingham is weaving which should prove interesting. It looks like we're going to get a battle of the witches again, Flycatcher is set up for a really big role, and I actually really like the Charming-Beauty-Beast leadership team. (I just hope the plan isn't to have things blow up in their face so that Snow and Bigby can come back.) He does a good job of juggling a large cast, several competing stories, and making everything feel linked. I picture Willingham's writing room with large maps, charts, and lists all over it to keep track. Though I guess in these days of computers, it's all in a file somewhere. Either way, I'm impressed. The Fables world is nearly as large as the DC Universe itself, and probably is bigger than the world Constantine and Swamp Thing inhabit. Making sure everything fits has got to a constant job for Willingham, his sometimes-partner Matt Sturges, and the editor. Giving each character their own style of speaking would also be a problem in other hands, but Willingham's very good at that, too. I mention this for the review of this trade because we have no less than about two dozen main characters make appearances here, but they all have a unique voice. Pinocchio is different from Boy Blue who is speaking distinctly from Bigby and his father, the North Wind. Part of what makes Fables so appealing is Willingham's ability to make the characters feel modern and yet everything they say (when it's not political ghosting) fits in perfectly with their character from folklore. When so many Fables are talking at once, as they are here (because of the montage scenes and backups), it's a thing to behold and a real joy to the reader. When they do use another artist for a story arc, it's a good one. P. Craig Russell did the art for a special awhile back, and this time it's a personal favorite, Mike Allred. Allred's art style is nothing if not distinctive, and yet you can tell without any help from the dialog who Bigby, Snow, the Adversary, and others are. It's a tribute to the series that even guest artists are chosen by their ability to keep the look holding steady. This trade is a transitional one, and as a result the stories themselves are not as strong as some of the past books. But I like the direction Willingham is moving, away from some of the politics and back to the idea of "Hey, it's cool to play with fairy tale characters with a dark edge to them, just like in the old days of Grimm." When the two main sides inevitably clash, I may get annoyed again. For now, however, I'll be happy to see the strong world-building that Willingham created (and still creates) bear fruit as the story of our Fables continues to grow.